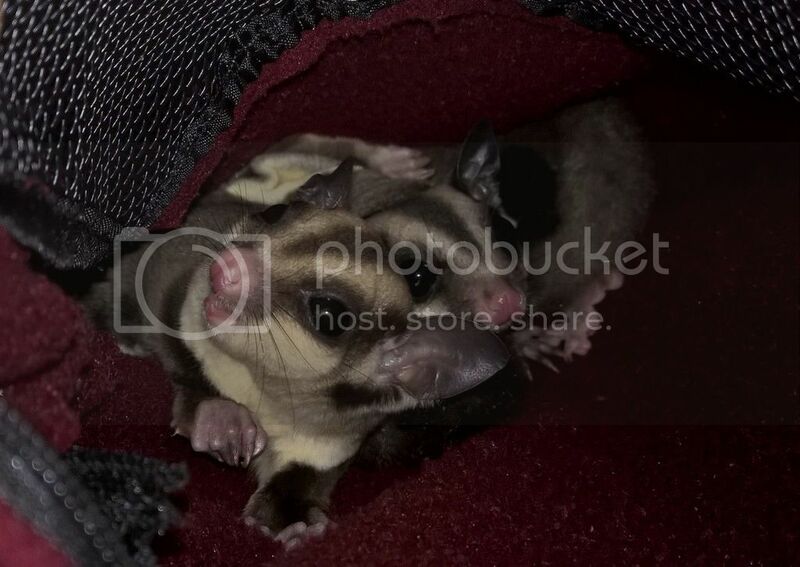 I've had my sugar gliders for 1 1/2 weeks now, and I just tried using a bonding pouch yesterday for the first time. My little girl was already in it in the cage, so I zipped it closed and took it out. She crabbed quite a bit, but eventually calmed down and let me pet her through the fabric. However, whenever I would move or clear my throat, she'd crab again, for maybe 10 seconds or so. She definitely would calm down if I was just holding her and petting her and not moving or making any sounds. Is this normal? I just felt like I was stressing her out and not helping. Or is that what's supposed to happen the first time? That is normal, specially for the first time. Just keep up with the rubbing her through the pouch. Humming also helps, talk to her. It just takes and patients. Yup, totally normal! I couldn't eat while wearing the bonding pouch in the early days, because they would wake up and crab at me. They just need time to get used to your sounds, smells, etc., and then to associate the experience of you with safety. You'll get there. Time and patience.